If you are unsatisfied with your purchase from The Brain Stimulator for any reason, you have 30 days from the date of purchase to request a full refund. You may return any Product (excluding electrodes) purchased directly from The Brain Stimulator. To qualify for a refund, all the following conditions must be met: (a) a Return Merchandise Authorization (RMA) must be requested from The Brain Stimulator’s customer service team within 30 days of your purchase date (to request an RMA, contact The Brain Stimulator directly at info@thebrainsitmulator.net); (b) Returned Product must be in good physical condition (not physically broken or damaged); and, (c) all accessories originally included with your purchase must be included with your return, unless otherwise directed by The Brain Stimulator. The RMA number must be included along with your returned Product. Shipping and handling charges, gift-wrap fees, and taxes paid (e.g., state, customs, VAT) are not refundable. You are responsible for and must prepay all shipping charges and you shall assume all risk of loss or damage to the Product while in transit to The Brain Stimulator. If you return Product to The Brain Stimulator (a) without an RMA from The Brain Stimulator or (b) without all parts included in the original package, The Brain Stimulator retains the right to either refuse delivery of such return or charge you a restocking fee of 15% of the original price of the product or the retail value of the missing accessories, whichever is higher. Refunds will be processed and paid within 2 weeks of The Brain Stimulator’s receipt of Product. For quality control reasons, this 30 day return policy does not apply to electrodes which have been removed from their original packaging. The Brain Stimulator warrants the electronic devices and other products manufactured byThe Brain Stimulator (for purposes of this section, the “The Brain Stimulator Manufactured Products”), and only theThe Brain Stimulator Manufactured Products, against defects in materials and workmanship under normal use for a period of ONE YEAR (365) days from the date of retail purchase by the original purchaser (“Warranty Period”). 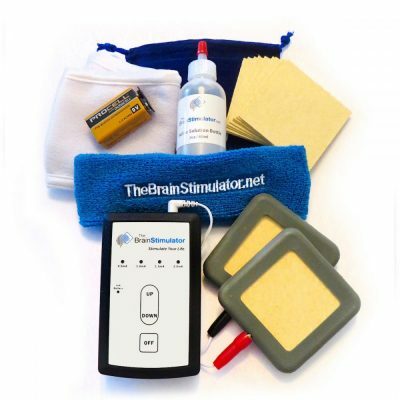 Under this Limited Warranty, if a hardware defect arises and a valid claim is received by The Brain Stimulator within the Warranty Period, at its option and to the extent permitted by law, The Brain Stimulator will either (1) repair the The Brain Stimulator Manufactured Products at no charge, using new or refurbished replacement parts or (2) exchange the The Brain Stimulator Manufactured Products with new or refurbished The Brain Stimulator Manufactured Products. In the event of a defect, to the extent permitted by law, these are your sole and exclusive remedies.